Lilla Rose giveaway, y'all. Click for freeness! | House Unseen. Life Unscripted. Wait, where was I? Oh! Katrina! So Katrina is an independent Lilla Rose consultant and she sent me and my girls three different hair thingies to try so I could host a giveaway for y'all. Of course. Because: FREE. This is a flexi clip. You can check out the sizing and style page right here but lemme just tell you that even in Katie's super slick slippery hair and in my layered-out-the-whazoo hair, the flexi stayed put. It's really a genius concept and I'm so glad someone thought of it. Wanna see ALL the flexi styles? YES YOU DO. Because you'll enter to win by leaving a comment with your favorite design. Clicky here for the cuteness. 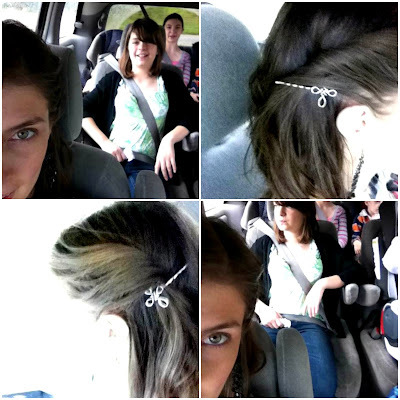 We also tried some cute bobby-pins, which I wore yesterday to Mass and tried to photograph myself in the van with my ipod. Quick. Someone take my blogging license away. 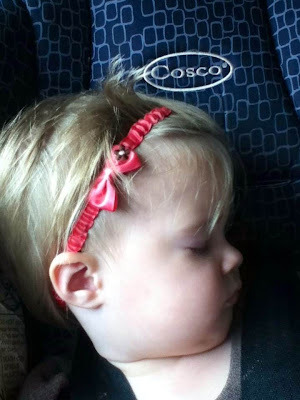 Hey, wanna win your own Lilla Rose flexi-clip sponsored by Katrina? Heck yes you do. We'll be choosing two winners to each with their own flexi-clip worth up to $16. Enter with the snazzy Rafflecopter form below and harangue me with any and all questions. p.s. This is me emphasizing the importance of importance of watching the sizing and styling videos before ordering, as it is very important to have the correct size in order to be completely happy with one's flexi. But if by chance you DO rder the wrong size, Lilla Rose will gladly exchange your flexi for free within 90 days. There is also a one-year guarantee on defective items. End of boring stuff. Love the flexi clip and adjustable headband. Would love to see if they'd stay put in my little one's super fine hair. Those are so darned pretty. I love the headband - etched. I am also intrigued by the O ring. Gotta go watch that video! They are all very pretty clips! If I had to pick one design favorite I guess I'd have to say the Celtic Knot (Brown). Would love to try them for my girls and I! I love the Etched Tiger Lily flexi! Let me put that clip to the test. I love the celtic knot flexi! I have GOT to win one of these Lilla Rose giveaways someday. My ferret tail is again crying out for mercy!! I don't know what happened with my comment -I'll try again! My favorite is the Celtic Cross Jet! My favorite is the divinely framed jewel flexi. These are lovely. I'm such a sucker for a beautiful hair accessory. I especially love the headbands. These are great. I wear my hair back all of the time and something like this would make it look more like a hairstyle and less like a busy mom needs low maintenance thing to do with hair. I'm loving the Opened flowered Gold flexi. All of them are beautiful, but I especially like the Celtic Knot and the Floral Design! I'd love to find something to keep this crazy, thick hair of mine lookin' non Brillo padish. My daughter has super slippery blond hair. These would be perfect! Thank you so much. These are so pretty!! Almost always wear my long hair up in a boring ponytail, these would class it up so much! I love the Celtic cross flexi! I love the plumeria flower extra small flexi clip! I love the ones with red in them, like the simple danglie in garnet. I like a touch of red somewhere on me...that's why my engagement ring is a ruby. :) Lilla Rose products are amazing and I'd love to win one. These are so lovely! So happy to have a 3-week-old girl to spoil with girly things like these clips now! I think the simple band flexi is beautiful! I gotta enter this bc, you know, free. And I love mine. I want a gold one now, like the gold celtic knot. Love the celtic knot design. I like the rose design...now I forgot what it's called! I love the beaded headbands! They're all so pretty, it's hard to choose! I think I like the Roman Cross in Antique Brass the best. I like the simple band the best. Looks like it'd go with anything. You know, I keep reading about these. Considering my hair is always up in a ponytail or bun, I guess I should give them a try. I like the Roman Cross Style best, but they are all pretty. I keep looking at them but the styles all seem too . . . fancy for everyday work wear (the most plain one is coated in nickel, to which I am very allergic). I'd still like to try them, though. It looks so much easier! I like the medium multi colored stone cluster! I would like the small flexi Flitter into Fall for my sister because it matches the dragonfly earrings I got her! Beautiful stuff! Thanks! I've won 2 of these off of blogs already, so I'm gonna keep my paws out of your giveaway. Just commenting to say I LOVE these things! I have 3 different sizes right now, and they are all so pretty. I feel much fancier in them than in just a ponytail. These look great for curly hair! You don't have to pull it through which pulls out the curl! Woo! Anonymous shout-out! Everything's commin' up Milhouse! I just got my first one of these for my birthday a few weeks ago! I've been wearing it pretty much every single day since. I would love to have another a smaller size (for half-up styles)perhaps in the celtic knot style. :) Gosh, give-aways are fun. Free is fun. ;) Thanks for hosting. This Irish girl loves the Celtic knot! I have two daughters with very different hair (fine/straight and coarse/curly) and would love to see how these would work for them. I love the twist in your hair with the hobby pin! I want the Tiger Lily for my baby Lily! :-) Thanks for hosting! The multicolored and "hues of blues" are my favorites but they're all super pretty! I love them all. But if I could choose, it would be the Festive Fallen Leave in small size that my daugther and I could share. I see they have an owl one and now I must have it!!! These are all so dang pretty! I love the Simple in Iris Purple flexi! Perfect for my DD's wavy, frizzy, looonnnngggg hair!! So pretty! Love the simple flexi clip! I like the Simple Band Black Nickel. I tried to win one at Fine Linen and Purple last week, so this is a second chance! I like the lovely circle stoneset. Good luck! I have a couple more in the works so watch my FB page. Or, you could just host a party and earn some freebies yourself! SUPER CUTE!!! I have never heard of them before!! I would love the Intricately Designed Motif; or the turtle Flexi or the celtic nikel too... but the FlexiOh! is great too!!! I've always loved the celtic knot ones! But the Roman and Celtic crosses are calling my name too! Winner's choice, you can pick whatever you want if you win! Nice! Nice! Nice! They are all super cute. Hey! BTW, did I read correctly that you were once a UD student? Asking only because my eldest is shooting for that school. Any tid-bits that I, as her Momma, would like to know? I like the celtic cross or celtic knot. They headbands are cute too!! Really want to try one of these! Definitely prettier than just a hair band. And boy can I rock one of those! Celtic knot flexi! in gold! So many pretty ones, but I think I like the Celtic cross the best! I love the fancy bobby pins, but everything is so darned cute it would be hard to pick! They're all so pretty, but my favorite is the scrollwork design wood! As someone who's hair is perpetually in a messy ponytail, I like anything that can improve on that! The Hawaiian Flower with pink is really cute. I love the Celtic Knot design! I love these! I need something easy but pretty to do with my hair (which I tend to wash, brush, and ignore)! I LOVE so many of these. But I think my favorite is the Celtic knot medium flexi-clip because my everyday earrings are silver Celtic knots. Now I'll have to keep an eye on these and see which would work for my daughter too! Want. I've wanted one of those for forever. How is it that I don't have one yet? I really like the Celtic Knot in Black Nickel. My 6-year-old daughter has super-silky hair that defies all attempts to contain it! I can't speak for her choice, but I am a huge fan of the celtic knot designs . . . I have long hair (& lots of it) but it's still fine enough that nothing can hold it up. My flexis work & I love them. I have the Fleur-de-lis & it's my favorite, but I would love to have a Sparkling Snowflake or Fairy Aurora Borealis flexi. I'm clearly doing something wrong on the Rafflecopter thing, but I love Lila Rose! I have three sizes in my house and a total of 6 or 7 flexis. My fav is the Majestic Cross, but I'd love to have a Day-z. Daisies are my favorite flower! I like the celtic knot and flour-de-lis flex clips. Such pretty shots - I've been reading about flexis and they seem pretty cool! I like a lot of them, but I'd probably choose the scrollwork design wood. The treble clef is my fav, because I can look all music teacher-y while hopefully not having my hair pulled when I'm home! Ooh, these are such pretty hair clips! How is it that I've never heard of Lila Rose before?!!? I love the Tiger Lily. I own the Celtic Cross and get frequent compliments!